I do love a bargain, especially when its a good quality one and I know I'm saving money too. 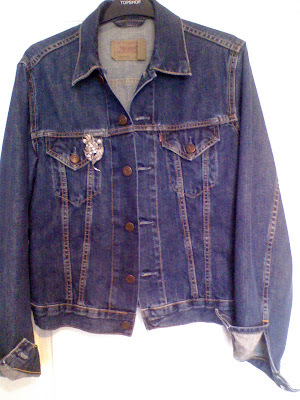 My trip to the boot sale on Sunday only yielded one item, which was this Levis for Girls denim jacket for only £1. Well, you can see how much I've saved than if I'd gone to the Levis store to purchase one!! I have 2 Levis denim jackets now and my faded one from River Island. I gave some denim to the charity shop, which included another denim jacket I had and some denim skirts that didn't fit properly. I'd rather look out for some different ones as I'd gone off these items. The beauty of thrifting means that items can be 'easy come, easy go' without feeling guilty. I had originally spent around £10 for 1 denim jacket and 3 denim skirts that I've now given to the charity shop and they now benefit from my fickleness!! well done...i'm all about denim jackets worn over sweet little dresses for spring! Nice going, Sharon! That jacket is perfection. Great find, S! I love denim jackets, especially really broken-in ones! Great find! I still need another one for spring. Hopefully I will find it at saturdays flea market. Did you stop by my blog and see what I got over the weekend? It's stuff for the boys, but bargains nonetheless! I snapped a H&M one brand new from a charity shop, it still had it's original tag in ... it also cost me £1 and it was one of the bargains of the year for me! 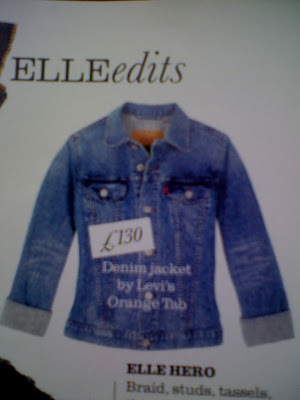 £130 for a denim jacket that’s just madness! I always come across good denim jackets at markets & in charity shops for a few quid, some used & some brand new, it just blows me away to think that anyone would spend that amount of money on a casual jacket, especially at the moment when pennies are as rumour has it, scarce! You always find the best deals, Sharon! You inspire us to be better thrifters! wow..that's a cool jacket. great find..£130 is to expensive, i dont wanna buy with that price. I've always wanted a denim jacket but never bought one because I thought it was too expensive. You've given me an alternative! Thanks! Denim is a great find because it's so versatile and lasts forever - even if it's been worn before! And it's one of those pieces that actually suits the well-worn look. Love the jacket and what a bargain. honey you keep finding the coolest demin jackets! I heart this one! Denim jackets are a wardrobe essential~ Fab finds! nice going..thats great that you gave back too..so someone else can find a treasure too. all the best on the thrifting. The jacket was such a bargain. Its good to hear from you. I hope you are having a nice warm spring week there. Finally, warming up here. Wow Sharon, Another amazing find!